There is no question that technology is a dynamic and forceful agent for change in education. As we prepare our students for a world where technological growth is exponential in nature, we must be purposeful and diligent in incorporating digital resources into our students’ experiences. As a school, Fort Worth Country Day is committed to expanding our students’ technological toolboxes. To this end, the FWCD Middle School will require every student to have his/her own iPad. The implementation of a tablet program in the Middle School has two primary objectives. The first is that students will have a highly portable, comprehensive and personal learning device. Each student will have all his/her notes, homework and eventually books with them at all times. Efficiency and organization will be maximized. The second aspect is the enhanced actualization of the Six C’s as both a learning and teaching tool. The Six C’s are defined by the National Association of Independent Schools as the skills and values the 21st century will demand and reward. These Six C’s are creativity, character, critical thinking, communication, collaboration and cosmopolitanism/cross-cultural competency. Through enhanced communication capacity, collaborative learning will not end at the conclusion of a 45-minute class. Classes may not be limited to the students in the room or even in the country or the same culture. The removal of the classroom walls will allow teachers infinite creative opportunities for the best way and the best place to deliver concepts. Students will also be equipped with a device that frees them to new avenues for creative expression. The iPad was chosen based on its balance of capability, simplicity, portability, the availability of appropriate apps and the number of peer schools we can learn from. Teachers will also have an iPad so that they may lead students in engaging and collaborative experiences. As students progress, through the academic and professional realms, digital expectations rise and technological skill and savvy are a prerequisite for success. Providing students with this learning tool does more than enhance their experience at FWCD, it allows for new experiences that are not possible without them. 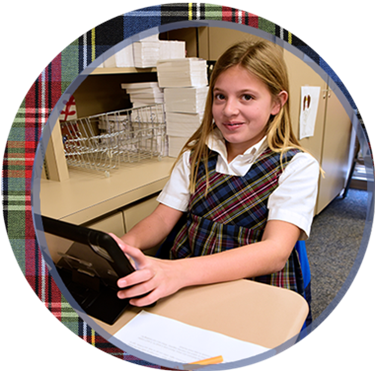 Appropriate instruction, facilitated learning and responsible digital experiences will be the hallmarks of this program, which has been designed to add to our students’ foundation for a lifetime of learning. By introducing the tablet program at the Middle School level, we are expanding the digital skills of and exposure for our students, thus positioning them for success.